The story of two unlicensed and abused intellectual properties mashed into one. 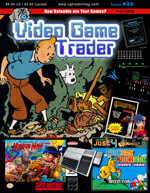 As with most lucrative forms of business, the coin-operated video game industry had unknowingly invited an unwanted guest – PIRACY! While it started with clones of Atari's PONG , it exploded during the heydays of the eighties, and despite the decline in popularity, still reared its ugly head come the new millennium. Backtrack two decades ago to the year 1990 and you may have found the unlikely marriage of two of gamings greatest – Pac-Man and Pokémon . 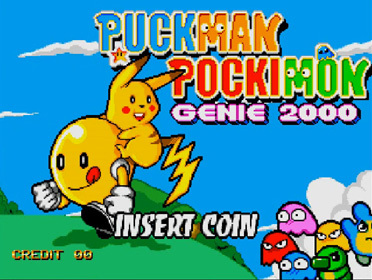 Puckman Pockimon is a bootleg coin-op (running on the Sega System C2 hardware ) released by the one-game publishing wonder, Genie 2000. The game sports different mazes from actual legit Pac-Man titles such as Ms. Pac-Man and Super Pac-Man. It also allows for two players to play simultaneously, allowing player one to control a stylized Pac-Man and player two to play as the disembodied head of Pikachu, the popular short, chubby, rodent-like yellow Pokémon character. But wait, the title screen reads Puckman – not Pac-Man . Well, Puckman was the original name for Pac-Man in Japan. When Midway (a division of Bally at the time) licensed Puck Man from Namco, they decided to alter the name in an effort to avoid the obvious act of vandalism that teenage boys might immaturely pursue – changing the “P” to an “F”. But... but.. Yes, we recognize that Pokémon is misspelled as “Pockimon”. Pokémon is short for “Pocket Monsters” so chalk that up to trying to avoid some litigation from Pokémon owner Nintendo, or simply a bad translation or misspelling upon entering the Chinese grey market. Speaking of Chinese, this game proudly displays a random digitized photo of an Asian woman between levels. So, if you are a fan of Pac-Man , Pokémon and beautiful Asian women, then the Puckman Pockimon game HAS IT ALL and is definitely for you! As one would imagine, it plays very similar to most Pac-Man titles – traverse a maze, chomping on dots while being pursued by ghosts, and now, pocket monsters. Turn the tables by devouring a power-pill and hunt the hunters to rack up BIG points. While most plagiarized games play rather dull, the good news is that Puckman Pockimon actually has a great deal to offer. 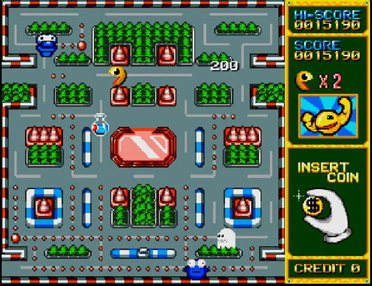 Foremost, it offers a series of new mazes; the first new Pac-Man levels since Jr. Pac-Man was released seven years prior in 1983. Puckman Pockimon introduces thirty-two distinctly new mazes to maneuver, beating the infamous Ms. Pac-Man, released by Tengen, for the Sega Genesis console by a full year. Puckman Pockimon also adds enemy-free BONUS BOARDS periodically throughout the game. During the challenge stage, additional points can be scored by eating dots, and bonus items such as the coveted 1up, can be acquired if one is fast enough to reach them before the timer expires. So, if you do not mind playing a game that is a bit shady and obviously unlicensed, and you can find your way safely to the black market (and back), then give Puckman Pockimon a quarter or two. Waka Waka!